Judges of the 2007 Peugeot Design Contest have completed their back-room calculations and came up with a winner. It's the Flux, by Romanian Mihai Panaitescu, and it's gained him 6,000 in prize cash. 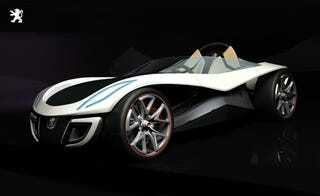 The hydrogen-platform roadster beat out 30 designs in the finals, culled from more than 4,000 entries. Now, the Flux will be built in full scale, to be displayed at the Frankfurt motor show in September (remember the Moovie?). The rear-engined two seater has body panels of polyurethane and an aluminum suspension. Now let's see 'em build those wheels in three dimensions.